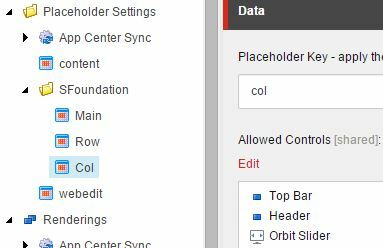 Sitecore - Page Editor Blog | what you see is what you get! An online discussion I had today with fellow Sitecore MVPs and enthusiastic Sitecore folks led me to write this post. All started on website projects that are not ‘DMS-ready’ or ‘DMS-friendly’, meaning Sitecore implementations that have not considered the possibility of the client making use of digital marketing (DMS) features available in Sitecore such as campaign management, personalization and A/B or MV tests. Such projects do require a lot of rework just to get to the point of being ready for using DMS. But nowadays we can definitely argue that most Sitecore projects implemented by professional Sitecore partners take “by default” such consideration and they are ready to enable digital marketing features. However, in most of them these features are marked as “Phase 2”. A phase 2 left of on the realm of planned ideas, a desired state that so far seem to be not materializing on most cases. And why that? First of all, why is it a phase 2? That’s the first question I had. Is it because partners are not ready to implement a solution that can right from the go-live date make full use of Sitecore digital marketing features? Is it because clients (Sitecore license holders) don’t have resources aligned and prepared on their end to use it? Or is it because each side doesn’t have yet a clear understanding of what and how can Sitecore digital marketing features actually be used to achieve the key online goals of a company’s web presence? I believe the answer is on lack of understanding of each other and also on some cases the lack of content and marketing strategists involvement during the requirements, planning and implementation phases of these projects. The lack of understanding I dare to say is mostly on the technical side of the project. Implementation folks (Solution Architects, Developers, Software Engineers, etc.) tend to believe that everything can be solved with just appropriate training of the “users” (these mythical creatures that will do everything to break the beautiful code we had put together). The code and the interface we created is wonderful! Everything was unit-tested, we did it all on agile sprints where all user stories were discussed, properly estimated and implemented with the latest frameworks available. We had CI, QA, UAT, and also a lot of other acronyms! It is all there properly implemented following best practices and the users can make good use of it or decide to ignore it and not to use it at all, “it is their call!”. And that (ignoring it) is what is happening on most cases. So, I am saying that the lack of understanding is mostly on the ‘techie’ side, but it is not only there. A veiled resistance comes from the marketing folks too. They fear the use of the new tool, a tool that they don’t completely understand and it seems it was implemented in a way that also doesn’t understand them. The moment they realize that it will be something outside their comfort zone it is easier for them to agree with postponing it to phase 2. And leave it there! And you guys on the development side feel free to jump to phase 3 first and come back to phase 2 later, no rush OK? Sounds like a plan? Can we build that bridge on Sitecore implementations? A bridge for linking and bringing together the people that is working running the marketing campaigns for our clients and the Sitecore implementation teams on partner, can we do that? The answer is yes, we can! We know that both sides are really smart and good on what they do. They may speak different languages but knowledge sharing and some translation in the middle is part of an education process that is healthy for both. We have a lot to learn from each other and working as a team on these projects is key to make it happen. My goal for this year (2016) is to work on that bridge. To get even more into the roots of the technical side of Sitecore digital marketing features but most importantly, to be able to understand and articulate the needs of the marketing folks and, by doing that, figure out what needs to be done in our implementations to make sure phase 2 will actually happen, and if possible not as phase 2 but as a crucial part of phase 1 of our projects. If that means crossing the bridge from being a Technology MVP with Sitecore to become a Digital Strategist one I am willing to go for it. Starting now I will be sharing more on that side over here. So let the ride begin! 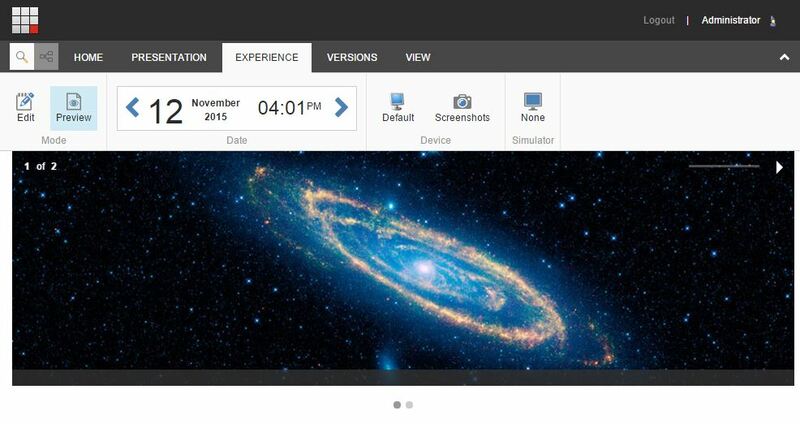 Orbit is a very nice and clean responsive slider available with Zurb Foundation version 5. Although it is being deprecated by the Zurb team, it will still continue to be supported. That’s because it really works well and many websites and front-end developers still use it. Anyway, the concepts presented on this post are applicable to the implementation of basically any other sliders available out there. I will soon be also posting here the use of this same approach to implement Slick Carousel, which is one of the recommended alternative sliders suggested by the Zurb team. The first part of implementing a component in Sitecore is defining its data model. In other words, how its templates are organized. 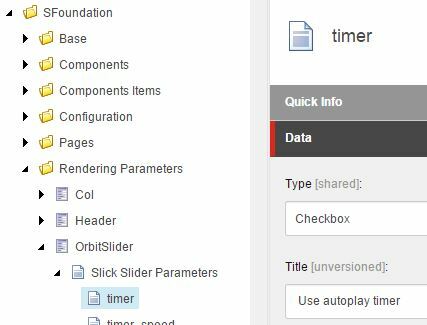 For this slider we will have three templates defined: one for the slider collection, one for the definition of each slide, and a third one for the component presentation parameters (aka rendering parameters). 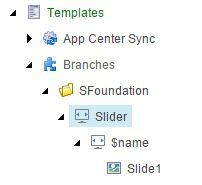 We will also have one branch template to automatically create the structure for sliders and slides, with a sample default slide, and one folder template to hold the slider components (and any other components) on a page. 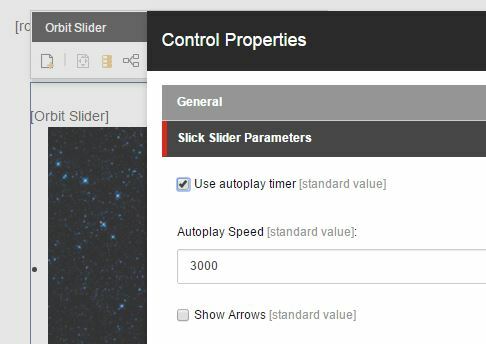 The slider template doesn’t have any fields, however it exists so it can have in its standard values the insert option configuration done to allow only the creation of slide items under it. The slide template has two fields: image and caption. 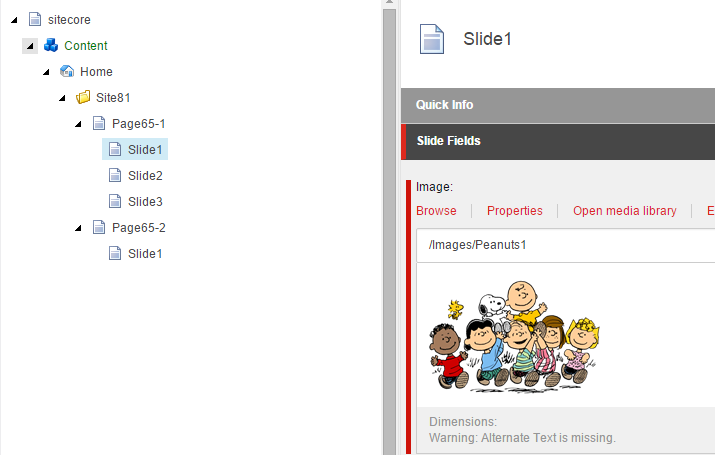 The image field will have a default placeholder slide image defined in the standard values of the template. 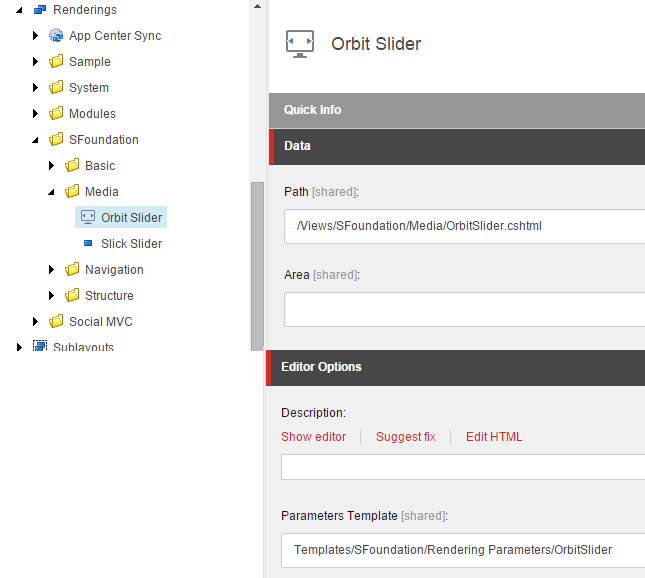 The Orbit slider has many possible parameters listed on its documentation (link above). We will in our example implement only three of them: timer, timer_speed and navigation_arrows. The image below shows where to do it for the timer field. The same thing needs to be done for timer_speed and navigation_arrows fields. 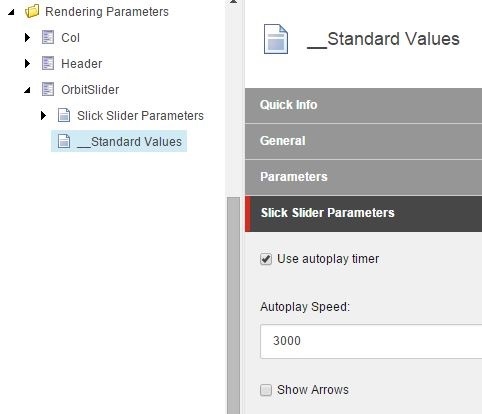 In the standard values of our Rendering Parameters template we want to put a default value of 3000 for the timer_speed parameter (Autoplay Speed) and define the timer default status to checked (Use autoplay timer). Our branch template will have the basic structure for a slider with one sample slide as its child item. This is a template with no fields. It will be used to define the datasource location for the view rendering (explained further down in this post). We will use a Sitecore MVC view rendering. Our view rendering item will point to the cshtml view that will be used to present the slider. We also define its rendering parameters template. Now we add our rendering component to the Allowed Controls list of the Col placeholder, which is our placeholder for columns in our Zurb grid implementation. In the content tree we want to organize the folders where sliders can be created. 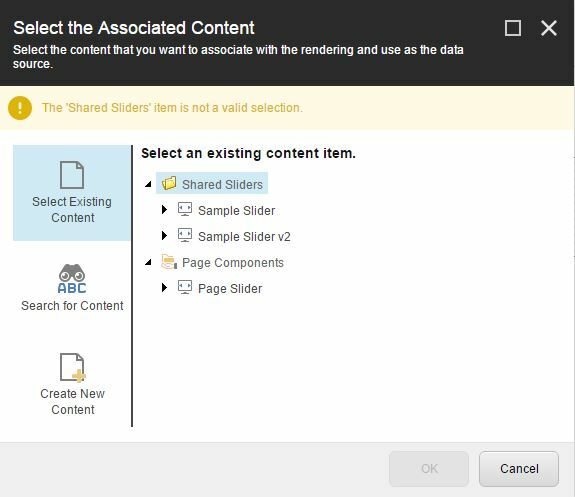 In our example we will have a Shared Sliders folder for sliders that are created once and shared with many pages in our site. Each page will also have a Page Components folder for sliders (and other components) that are created only for the scope of that page. To make these two locations available when setting the datasource for an item in Experience Explorer, we need now to go back to our view rendering item and define the Datasource Location and Datasource Template fields. We also want content authors to be able to add slides to the slider collection. 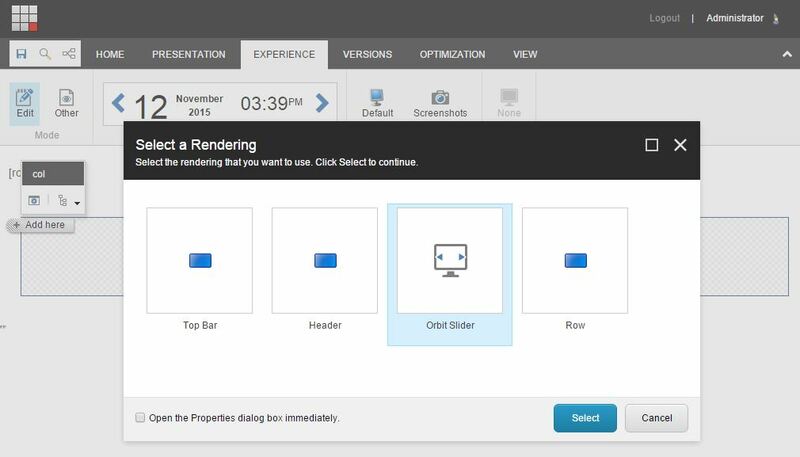 To allow for that we add the Insert button to the Experience Editor Buttons field of our view rendering. The implementation of our view rendering is actually pretty simple and it is based on the example provided by the documentation page from Zurb Foundation for the Orbit slider. The result on Experience Editor is that once we have a column added to a row in our grid we are now able to add an Orbit Slider to the column. 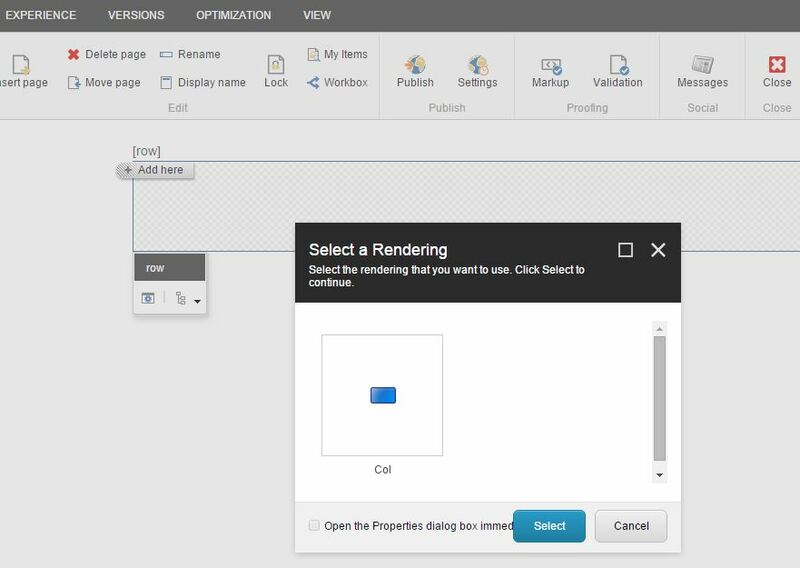 Once the slider is added, because we have defined the two queries on the datasource location field of the rendering view, we are presented with the two possible locations from where to pick existing content or to create new content for the slider. After selecting an existing slider we are presented with its collection of slides. 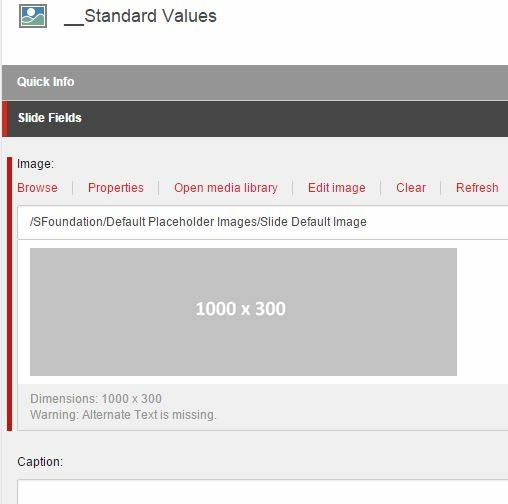 In case of selecting Create New Content a default placeholder slide image (from standard values) is presented on the default slide. You can now click on the image or in the caption field and edit its content. If you want to add a new slide, you just need to save your page and click on the Insert a New Item icon. While on Edit mode and having more than one slide in your slider, the slides are presented in a sequence to facilitate content editing. When switching back to Preview mode they are presented as they would look like in the final result. When you select to edit the properties for the component it brings you the Control Properties window allowing the content author to edit the parameters we have implemented for the slider. And that’s it for the Orbit slider. Hope the explanation for this approach I have used was helpful for you. Next time we will just tweak it a little bit to use the same approach with the Slick Carousel instead. 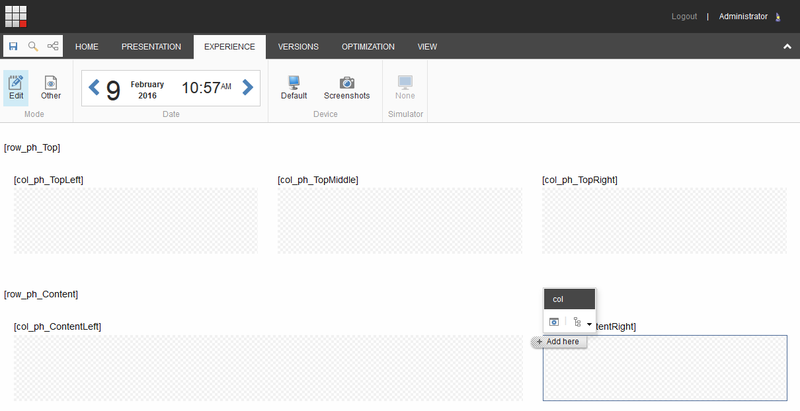 The “Edit component properties” button is a little bit hidden on Sitecore Experience Editor. You actually need two clicks to find it. One on the component you want to edit and a second click on the More dropdown to find this option. And that should save some clicks on a content author’s day. 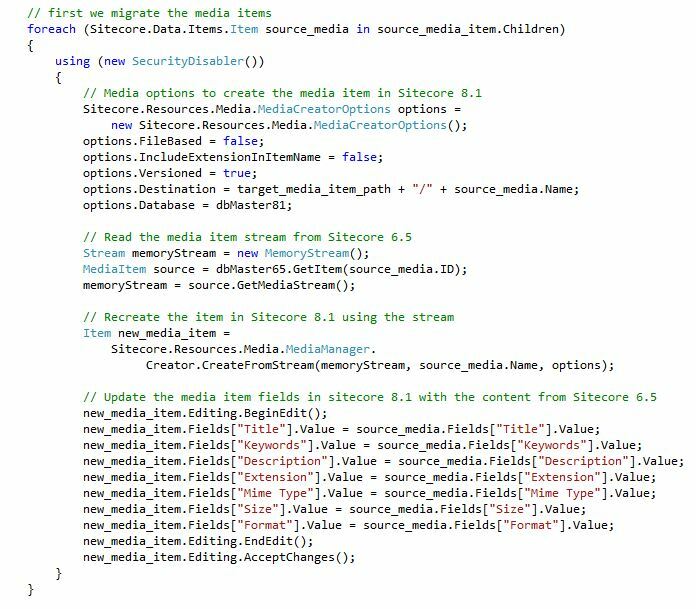 A question on Sitecore Community on how to automate migration of content from Sitecore 6.5 to Sitecore 8 led me to write this post. The idea I proposed was to set the Sitecore 6.5 master database as an additional database in the Sitecore 8 instance and this way be able to read the content from Sitecore 6.5 and switch to the Sitecore 8 db to write that content on it. I was not sure whether such idea would actually work or not, that’s why I decided to put it to a test and write a small PoC on it. 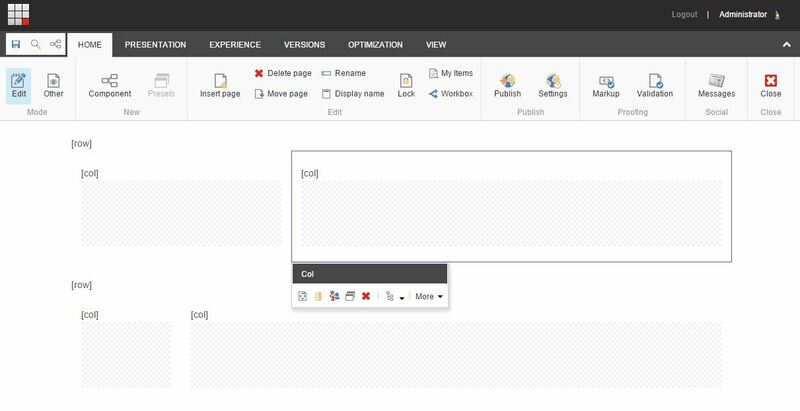 One of the suggestions on how to do it was to simply create a package with Sitecore Package Designer from Sitecore 6.5 and install it on Sitecore 8. However, as it is common on such scenarios, the new solution on Sitecore 8 didn’t have the same architecture, therefore simply packing and installing would not resolve the problem. Templates and fields had actually changed. In my PoC I am working with a simple but common scenario of architectural change in Sitecore. In this scenario we have one Sitecore 6.5 template with a pre-defined and limited set of fields for only 3 slides, while the new solution on Sitecore 8 we have two templates, with one of the templates being specific for slides, allowing for not just three but multiple slides to be added. In this PoC I am using Sitecore version 6.5 for the source and and Sitecore 8.1 as my target. 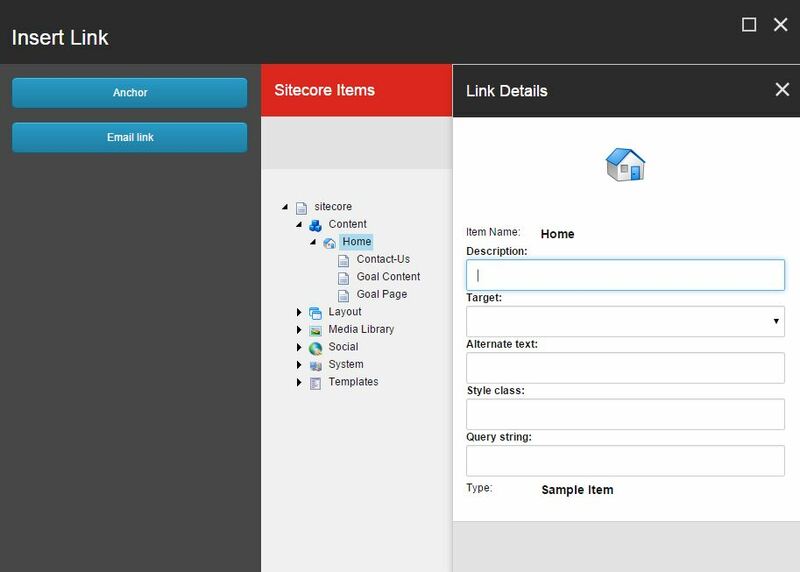 add a site using the new connection string to our Sitecore.config file (web.config in previous versions). 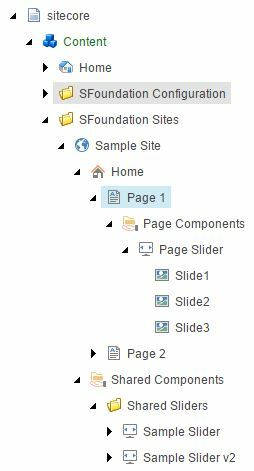 Migrate the Page65 items to Page81 items created on the fly (in a loop going through all Page65 items from Sitecore 6.5) moving Title to Title and Content to Content. All database connections for Sitecore are configured here. Prefetch/Master65.config is just a copy of Prefetch/Master.config. It could possibly just point to the same config file. First we get references to the databases, starting items (media library and content) and target templates to be used. All content from the Rich-text field is being migrate as is. In a real site migration scenario, where a new visual design is in place, there is probably a lot of cleaning required to be made on any possible HTML and inline styles on the content of the rich-text field. Additional logic for such cleaning should be applied to these fields following the requirements for the new design. The purpose of this post was just to test the concept of having Sitecore’s 6.5 and 8.1 databases being used together in a Sitecore 8.1 environment for content migration purposes. Internal links were not addressed in this post, I plan to do it in a future post. 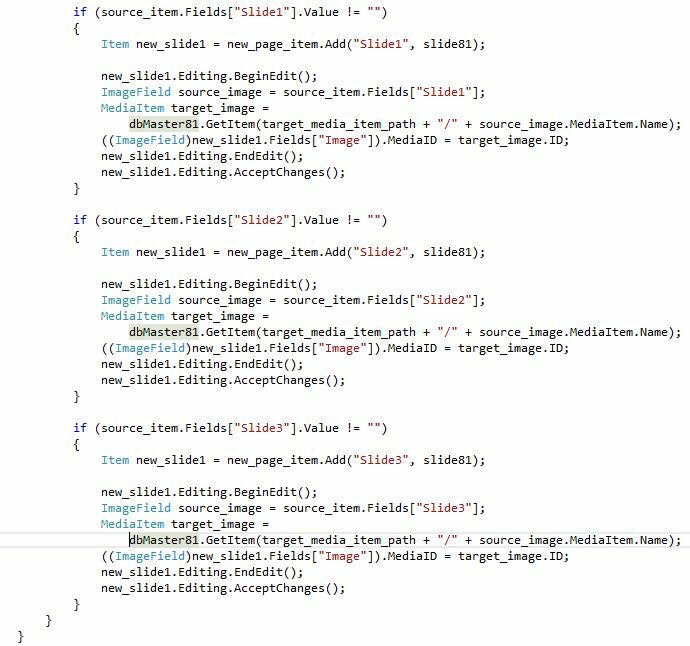 Basically the problem is that you can’t simply direct migrate the content of link fields because in Sitecore 8.1 the target items will have different GUIDs. The recommended approach is that you have the target content tree (skeleton site) created first in Sitecore 8.1 prior to executing the full migration. This way you can get a reference for each target path and get its new GUID when migrating such fields. This approach is also based on the assumption that the source and target content trees will follow the same pattern. On scenarios where the Information Architecture is different it will also be required to have a mapping matrix in place (e.g. /about-us/careers from Sitecore 6.5 maps to /our-company/opportunities/careers in the new Sitecore 8.1 sitemap). If you have any other observations to be considered by people reading this post, feel free to send them in a comment and I will get them published. Hope this post may be helpful to you! Thanks. Hello there, as everyone already knows, webforms development in .NET is going to die one day. Therefore, we shall embrace MVC. So during the past weeks I have been putting my hands (and head) on the MVC world and I would like to share with you a Sitecore 8.1 implementation of the Zurb Foundation grid based front-end framework. I am using version 5.5.3, you can download it from this link. Sitecore 8.1 still doesn’t have native support for dynamic placeholders, therefore I am basing my implementation on the approach recommended on this answer from Stack Overflow. It is not exactly the same code since I have changed the way it defines whether the placeholder is dynamic or not by placing a “_dph_” string on its key and made a few modifications to make it work fine with my Sitecore 8.1 instance. 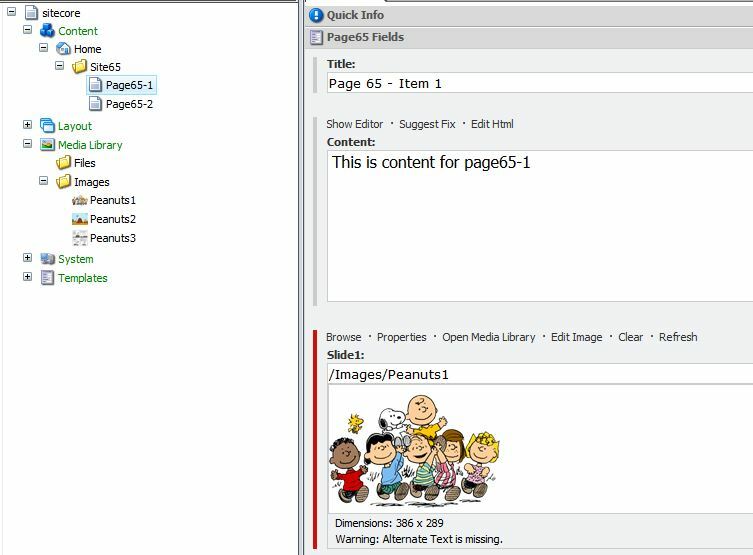 Dynamic placeholders are required so we can dynamically add as many rows and cols we want in a page, each one with its own placeholder with a shared key configured to accept specific renderings and also its own dynamically generated individual key to make sure the renderings are placed on the right placeholder. It is important to remember that as rendering parameters template, Col needs to have Standard Rendering Parameters as its base template. This base template is located at /sitecore/templates/System/Layout/Rendering Parameters. Our main layout will make use of Foundation css and js files. We could (and probably should) later add them to a bundle and use @Scripts.Render and @Styles.Render, but for now we will just reference them the classic way. 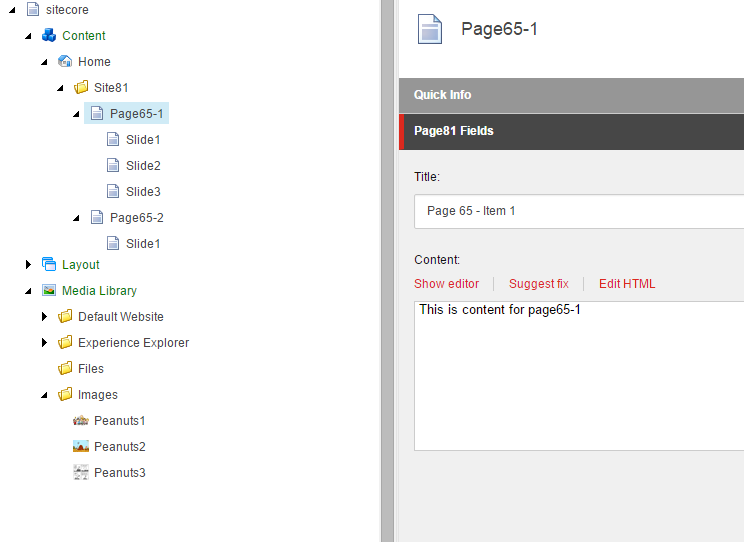 You have noticed that after inserting jquery.js we are verifying whether we are in Page Editor (Experience Editor) mode. To avoid any conflict with Experience Editor’s jQuery we add a jQuery.noConflict() call. We have one static placeholder called main. 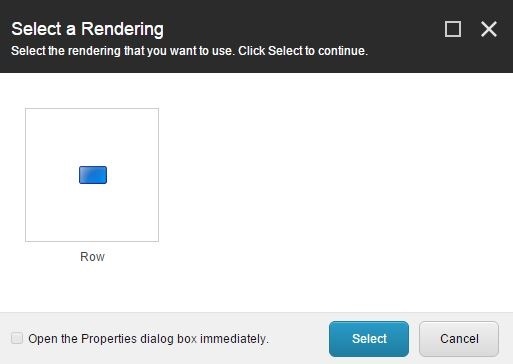 And this placeholder should be configured to accept Row renderings once we have it created and configured in Sitecore. We will write the Row and Col renderings to accept dynamic placeholders. The Col rendering will also read from the rendering parameters to define the size for the row. When we are in Page Editor mode we also want to add an extra line to identify our row and make it visible to be edited even if it is empty (with not other components added on it). 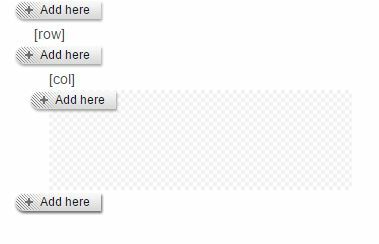 An extra blank line (<br />) is also added at the end of the component to provide space for the Add Here buttons when in Edit mode. 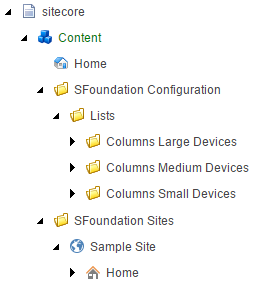 In Sitecore I am configuring the rendering items under /sitecore/layout/Renderings/SFoundation/Structure (SFoundation and Structure are two new folders I added). Now I want to configure the Placeholder Settings for my main layout Main placeholder, Row and Col. I create a folder for SFoundation and inside the folder I add three placeholders: main, row and col.
Main placeholder key is main and in the Allowed Controls we add the Row rendering. Row pladeholder key is row and in the Allowed Controls we add the Col rendering. Col placeholder key is col and in the Allowed Controls we add the Row rendering (allowing for recursively creating rows inside cols and so on). 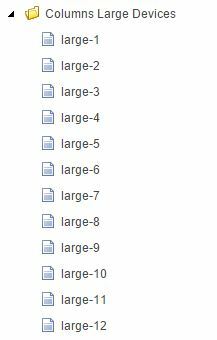 large-1 to large-12 items have no fields, they are created only to populate the rendering parameters dropdown list. 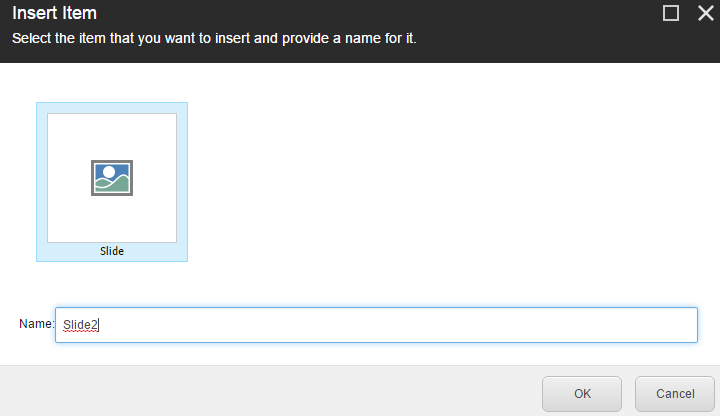 Once you click Add here you can then add your first Row to the grid. Once your first row is added you can now add columns to it. 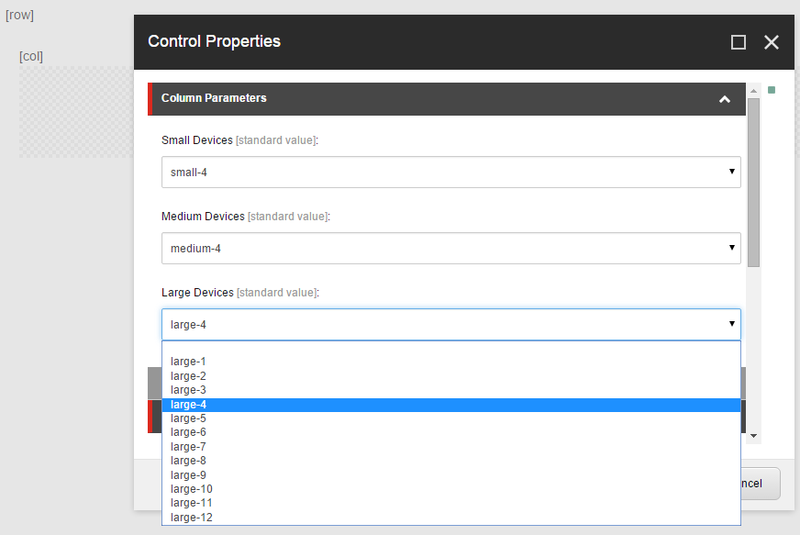 As soon the Col rendering is added it will prompt the user to select the size for the column. Thanks to the extra spacing added for when on Page Editor mode you can easily see where each Add here button will add a new rendering. Final result with two rows having two columns each. 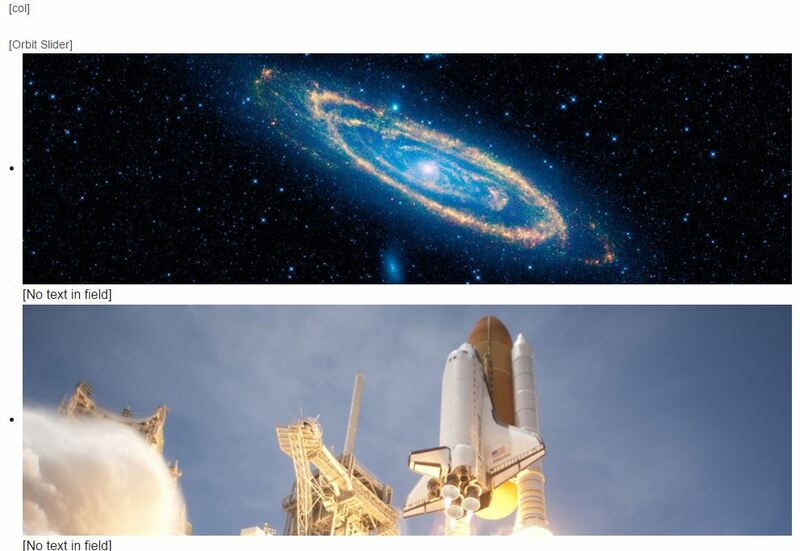 On the next post I will share my implementation of the first two Zurb Foundation components: Orbit Slider and Top Bar. It is just a small detail, but it seems visually broken. And I don’t like it. So, if you are like me and you also don’t like it and for whatever reason you are seeing the Add here button rendered this way, this is what you can do about it. There are two known issues with the latest release of the Sitecore Insert Link speak interface in Sitecore 8 update 5. 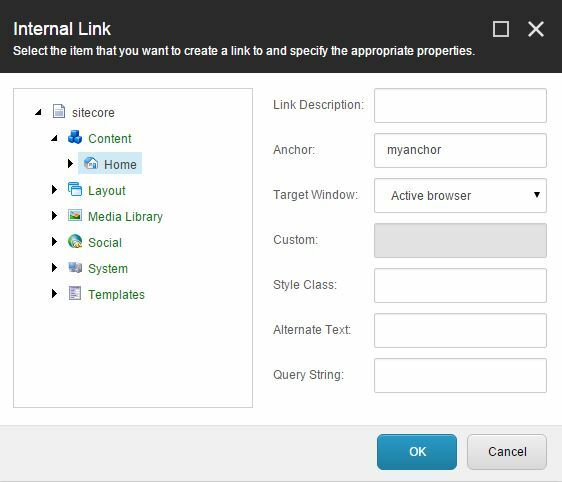 The missing anchor field for internal links and the Target dropdown not being populated. As shown above the fields available are Description, Target, Alternate Text, Style class, and Query string. The Anchor button on the top left allows you at add an anchor link on the same page you are editing, not to another Sitecore item. Anchor is back! Target Window is populated! Hope that have helped you today. When working with Sitecore and xDB somtimes it is important to have tools to help you to understand what is going on behind the scenes. 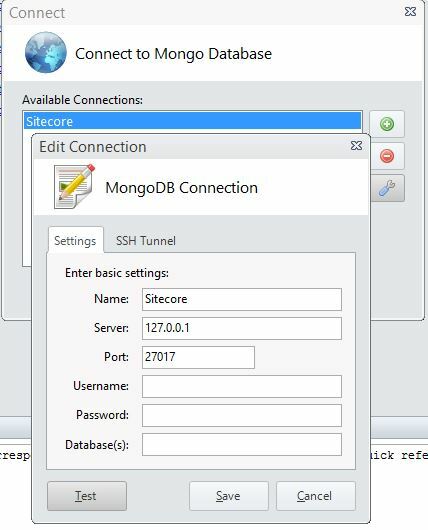 One of these tools is MongoVUE, which lets you browse the data from the Sitecore xDB collections in Mongo DB. After you have it downloaded and installed you just need to enter the details about where you have you Mongo DB instance running. In my case I have it working on my localhost. Let’s take a look on how interactions are captured. Interactions are saved in this collection every time a user visits your site. It can consist of one or many page views in the same interaction. It is interesting to note that although the visit ended at 1:31am the interaction was only saved about 10 minutes later. 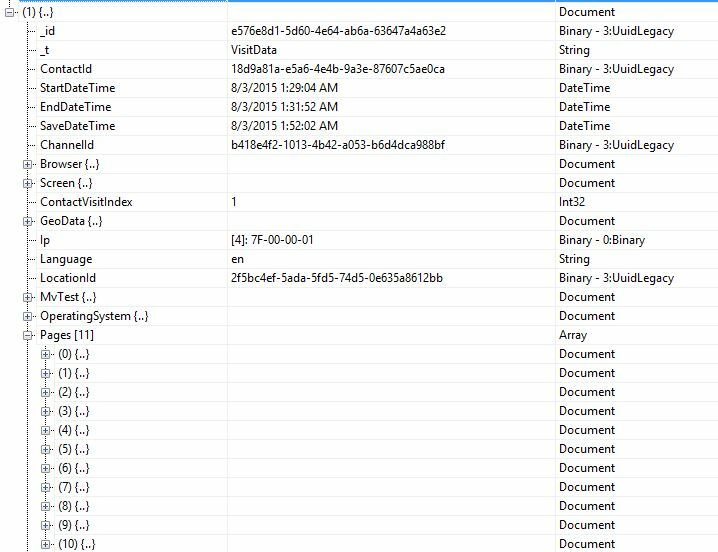 Technically the data was supposed to be saved on session end, but seems not to be the actual case. Therefore, when doing your tests, make sure to include some lag between the interactions and the data being actually saved to the xDB. Page events: as for example a long running operation. It is also interesting to see that any profile matches and the respective scores for each profile key are also saved. 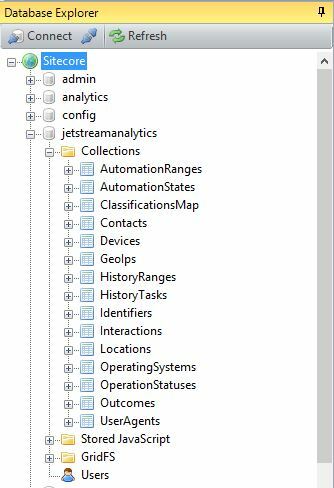 As you guys can see, MongoVUE can be of excellent help to better understand how information is capture and organized by Sitecore within xDB collections. It is available for download at http://www.mongovue.com/downloads/ Hope that was helpful in case you are looking for tools like that.